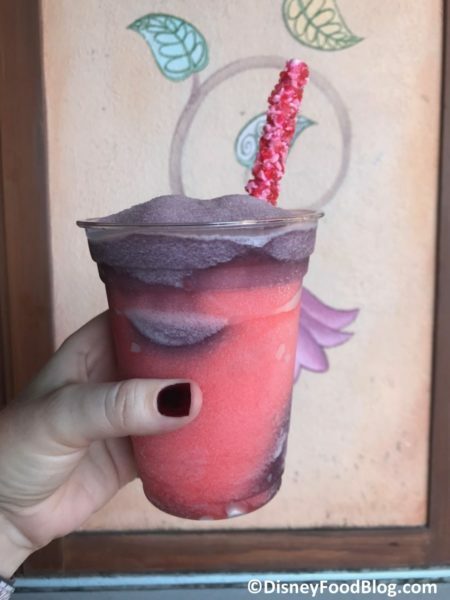 Frozen Slush drinks are by no means new to Magic Kingdom. 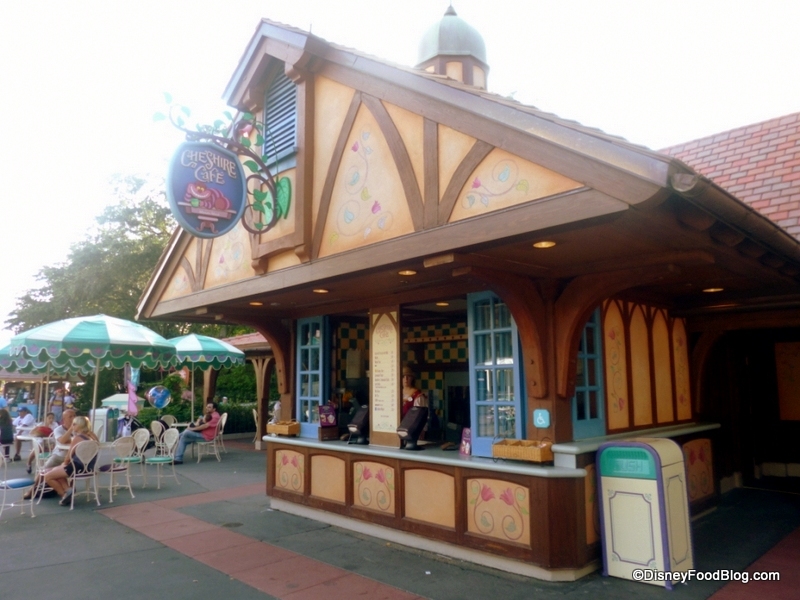 You’ll find them in all sort of places in a variety of flavors. Pinocchio Village Haus is known for changing it up with slushes dedicated to characters from the Pinocchio story and film (examples include the former Jiminy Cricket Slush and the current Blue Raspberry Slush in honor of the Blue Fairy). The Lunching Pad in Tomorrowland offers an array of Icee-type slushes in four different flavors: Blue Raspberry, Cherry, Minute Maid Lemonade, and Coca-Cola. Cheshire Cafe serves arguably the most popular versions of slush drinks: Lemonade and Raspberry Lemonade. 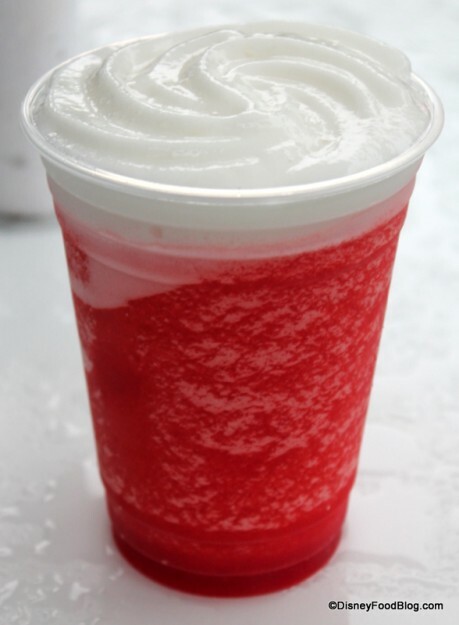 You can also find the Raspberry Lemonade at Sunshine Tree Terrace, along with a Pina Colada Slush (sans rum) to boot. And I haven’t even mentioned the Liberty Swirl Slush at Sleepy Hollow — a patriotic red-and-blue combo of Strawberry and Blue Raspberry. 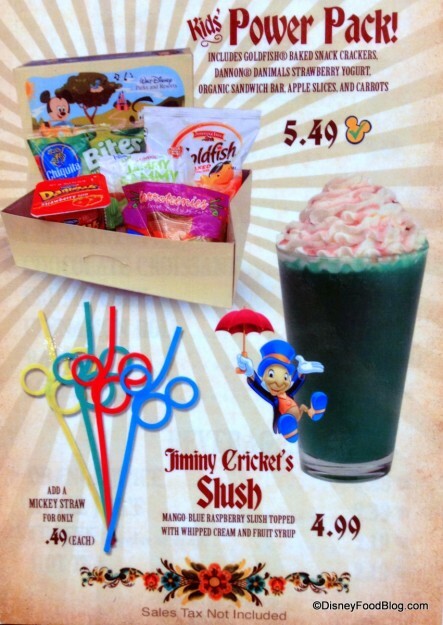 OR the Cherry Slush with FOMZ at Cosmic Ray’s Starlight Cafe. Still with me in spite of the brain freeze 😉 ? Good. Because there is a place that’s managed to fly under the radar in the Slush game, and that’s Columbia Harbour House. 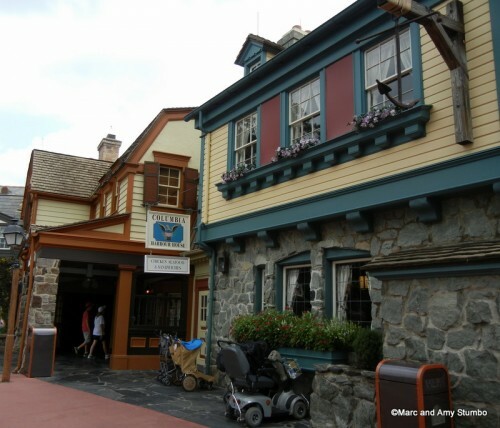 Like a few other spots, it does indeed serve the Lemonade Slush. 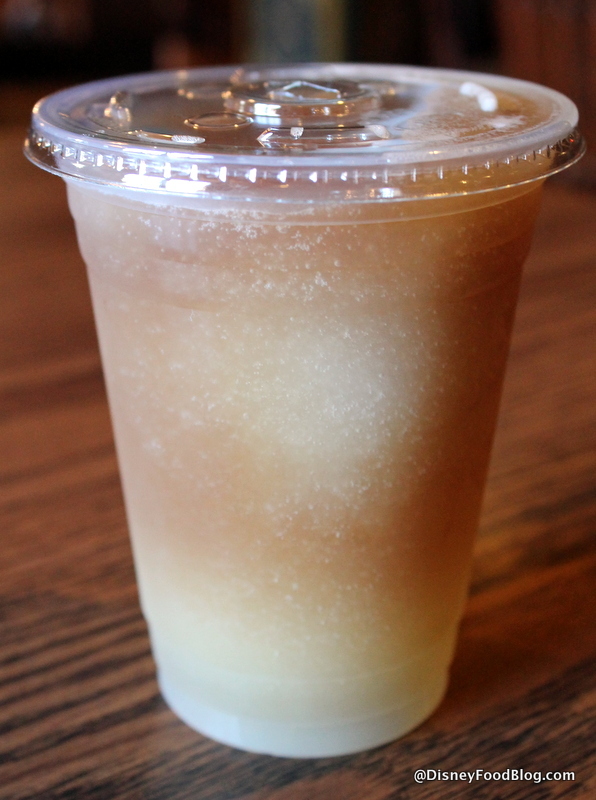 But they have their very own spin on this frozen treat as well: the Iced Tea Lemonade Slush. And I’d yet to try it. The Iced Tea Lemonade Slush has been on the menu for quite some time, but you’d almost never know it. 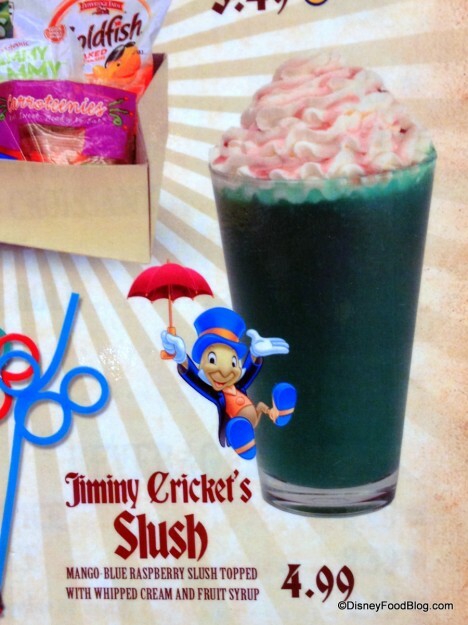 On the back of the printed menu, the Lemonade Slush gets tops billing with a big ol’ picture on the bottom left, while the Iced Tea version just gets a small mention on the upper right corner. 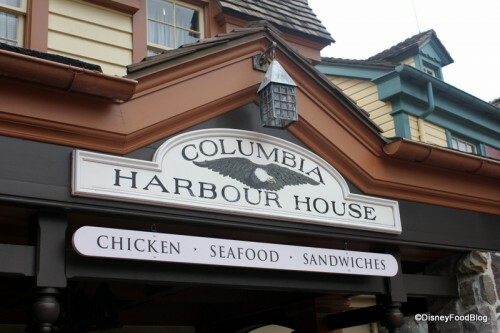 Columbia Harbour House menu. 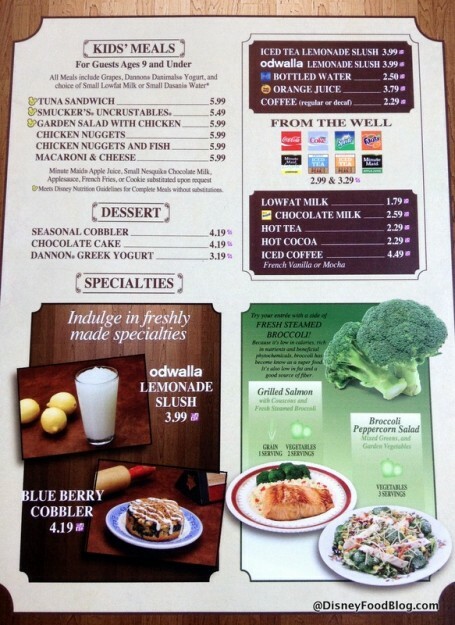 Mmmm broccoli. 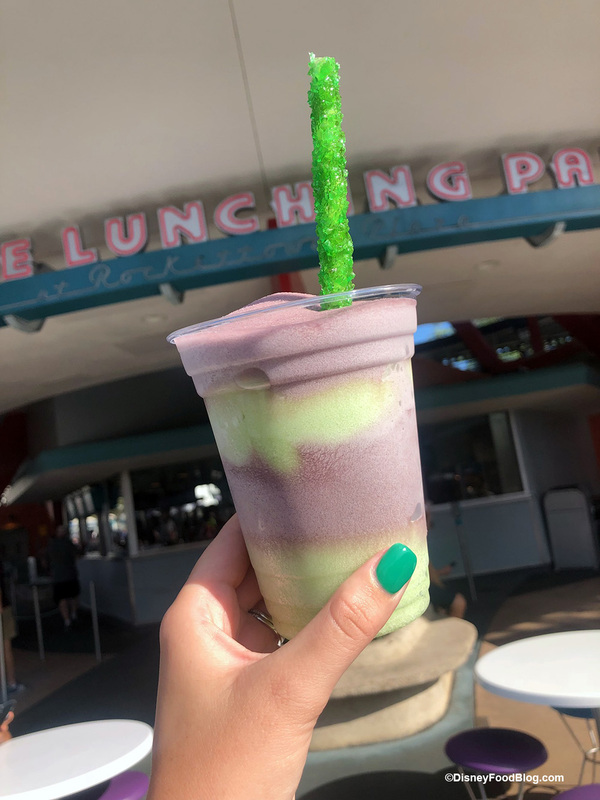 The Iced Tea Lemonade Slush comes to you not entirely blended, so you see both components — the Iced Tea Slush and the Lemonade Slush — in a “layered” effect.